Whether you are of Irish descent or just feel like you need a little good luck somewhere on your body, shamrock tattoos can be a great choice for your next ink. The plant known as a shamrock is one of the most popular representations of Irish culture. It is a three-leafed segment of the old white clover, usually of the type Trifolium dubium. 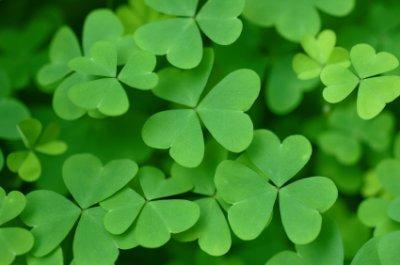 The name shamrock is also applied to other types of plants that have just three leaves, such as sorrel and red clover. A shamrock is not the same as a four leaf clover, however. These are the luckiest type of clover because of a mutation that causes an extra leaf to grow. These rare finds are valued even more highly for luck than the usual three leafed shamrock. The name shamrock is an English corruption of the Gaelic word for "little clover", seamaróg. The pronunciation of the Gaelic term is close to the way the English word shamrock is pronounced. 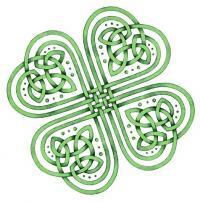 If you decide to get one of these shamrock tattoos, what exactly is the symbolism behind this image? Well, shamrocks have been used since Victorian times as a popular pattern for items such as clothing and decorations, and the shamrock is reported to have medicinal uses as well. Additionally, shamrocks are one of the biggest symbols of luck throughout the world - with many people equating a shamrock to other lucky images such as horseshoes and crossed fingers. The shamrock also has both a religious connotation and a political one. Catholics may use this image as a representation of St. Patrick, and his saint's day, March 17. The soldiers of the Royal Irish Regiment wear a sprig of shamrock on this day, the shamrock being their emblem. This emblem was decreed by Queen Victoria a century ago - in recognition of those Irish soldiers who fought in the Boer War. There are many different styles and versions of shamrock tattoos available for you to choose from, whether you would like to get one done from flash art or have a tattoo designed just for you. 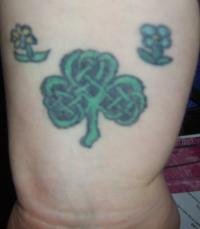 The popularity of shamrocks as an Irish symbol, as well as one of good luck, mean that many people opt for this foliage tattoo. Women as well as men can be seen sporting a shamrock tat, placed in a variety of spots all over the body. You can also choose to have a shamrock tattoo inked as part of a larger piece. For instance, the flag of Montreal includes a shamrock in its design (as a representation of one of the city's largest populations at the time it was created). The University of Notre Dame (the Fightin' Irish) also uses the shamrock as a symbol, as do several colleges and universities in the city of Dublin, Ireland. Or, you could use the shamrock as just part of a collage of "luck" items - including a horseshoe, heart, shamrock and whatever else is lucky to you. LoveToKnow's own shamrock tattoo picture gallery.